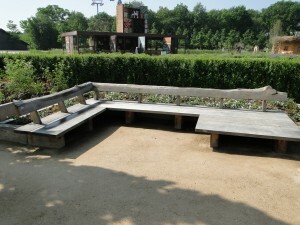 As part of the Floriade 2012 Master Plan, five themed fields were created, each with designs and planting plans from which visitors can take away ideas for their own home and work spaces. The theme Environment is based on the contribution of a green environment to the quality of our home and work environments. Located in the middle of the park, Environment showcases the use of plants to create a balance between urban and natural elements to create a restful green space. Fifteen office gardens are displayed in a row showcasing use of various designs in varied settings. The ‘conference garden’ offers year-round color and interest by combining bulbs with perennials. The addition of ample seating provides a welcoming invitation to use the garden. 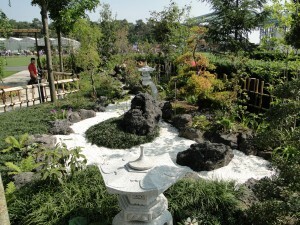 The Japanese Garden combines a sense of modern beauty with traditional Japanese gardening techniques to invoke peace and calm in an urban setting. 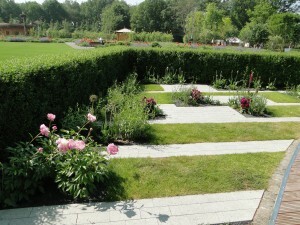 Throughout, the use of various pathway materials adds interest to the different gardens. Each of these gardens was designed by landscape architects from the Netherlands and other countries, demonstrating the compatibility of modern technology in a green environment. 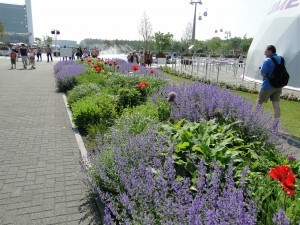 Throughout the Floriade Park, deliberately designed themed gardens are surrounded by large expanses of lawn interspersed with colorful flower borders. Though the season was just beginning with annuals just being planted, most of the borders were very attractive in a combination of purple and red from Nepeta (catmint) and Papaver orientale (oriental poppy). Alliums were in their last stages of flowering, though the flower heads were still attractive.